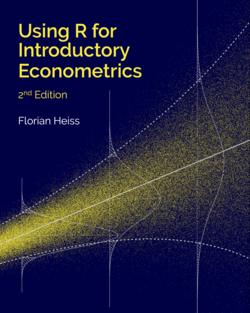 "A very nice resource for those wanting to use R in their introductory econometrics courses." "Using R for Introductory Econometrics is a fabulous modern resource. I know I'm going to be using it with my students, and I recommend it to anyone who wants to learn about econometrics and R at the same time." The chapters have the same names and cover the same material as the respective chapters in Wooldridge’s textbook. Assuming the reader is familiar with the concepts discussed there, this book explains and demonstrates how to implement everything in R and replicates many textbook examples. We also open some black boxes of the built-in functions for estimation and inference by directly applying the formulas known from the textbook to reproduce the results. Some supplementary analyses such as Monte Carlo simulations provide additional intuition and insights. The book is designed mainly for students of introductory econometrics who ideally use Wooldridge’s “Introductory Econometrics” as their main textbook. It can also be useful for readers who are familiar with econometrics and possibly other software packages, such as Stata. For them, it offers an introduction to R and can be used to look up the implementation of standard econometric methods. All computer code used in this book can be downloaded to make it easier to replicate the results and tinker with the specifications. The 6th edition of Wooldridge's "Introductory Econometrics" was published in 2016. The 5th edition of Wooldridge's "Introductory Econometrics" was published in 2013. While it misses some parts, it works as well. The 5th international edition of Wooldridge's "Introductory Econometrics" published in 2013 and lacks even more material, but for our purposes it works without any problems. Older editions are not perfectly compatible with regard to references to sections and examples. The book Introduction to Econometrics by Jeff Wooldridge published in 2014 is officially available in Europe, the Middle East, and Africa only. It is mostly consistent in terms of the main chapters, but does not include exercises, the appendices on fundamental math, probability, and statistics, and other material. I can do things like offer the full text for online viewing without asking a publisher for permission. Compared to your typical textbook, a hardcopy is really cheap.